It’s a match made in heaven – fictional archeologist Indiana Jones and the very real archeology of National Geographic. A traveling exhibition, “Indiana Jones and the Adventure of Archeology,” from the Lucas Museum of Narrative Art, has landed at the National Geographic Museum in Washington D.C. It uses the four “Indiana Jones” films to introduce field of archeology, and contrasts the behavior of archeologist ‘Indy’ with what authentic archeologists face. The interactive exhibition is at the museum until January 3, 2016. Indiana Jones has inspired generations to explore archeology. His well-documented ‘history,‘ though, is pure action adventure. “The Adventure of Archeology” points out that Indy’s style of archeology (based in the 1930s through 1950s) is very different from modern archeology, which puts an emphasis on the study of artifacts in situ rather than bringing them back to museums to be studied. The exhibition has ceramics and jewelry from the Americas loaned from the University of Pennsylvania Museum of Archaeology and Anthropology, better known as the Penn Museum, in Philadelphia. The fourth movie, “Indiana Jones and the Kingdom of the Crystal Skull” used South America for their adventure. The National Geographic’s Archeology Fellow Dr. Fredrik Hiebert and Dr. Michel Fortin of the Université Laval in Quebec City were the primary academics involved with the science and educational information. Visitors follow the “Indy trail” with hand-held tablets and headphones. 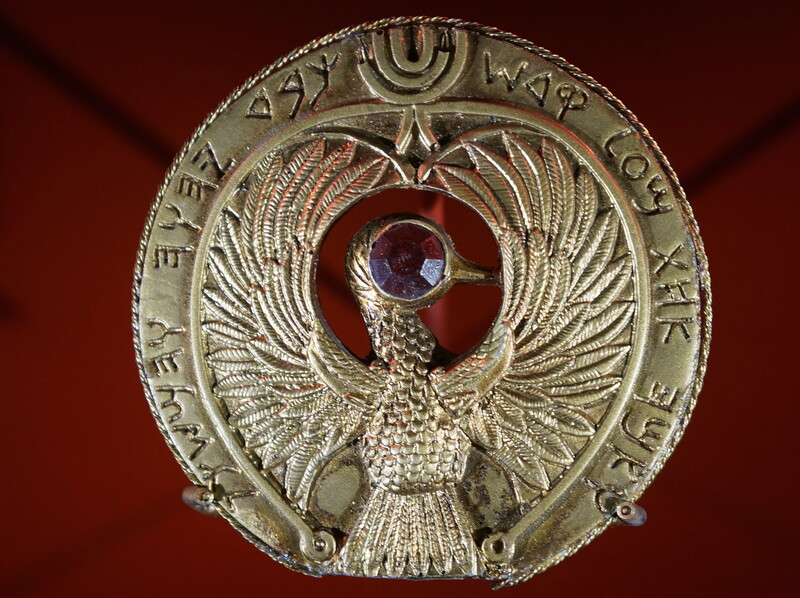 The exhibition starts with the first film “Raiders of the Lost Ark” comparing it with the ancient Sumerian city of Ur and authentic archeological findings there. Some exhibits are numbered which means they have further information. Tap the numbers into the tables, and more information is provided – either clips from the films or videos from experts. 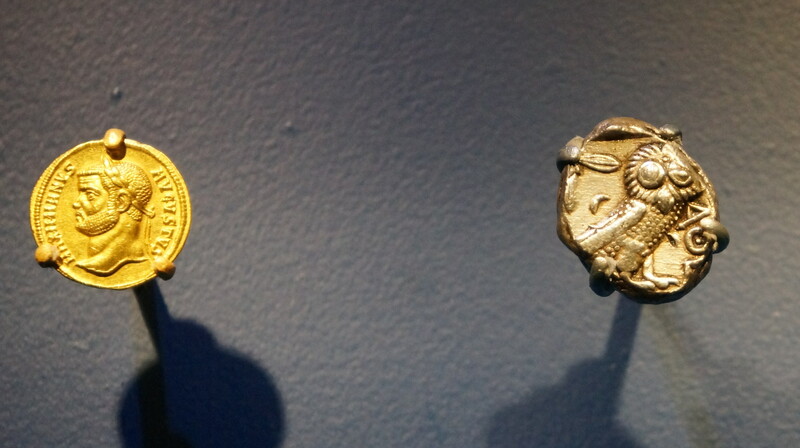 For example, for the display of ancient coins from China, Greece, and Rome, the audio explained about currency in different cultures through history. 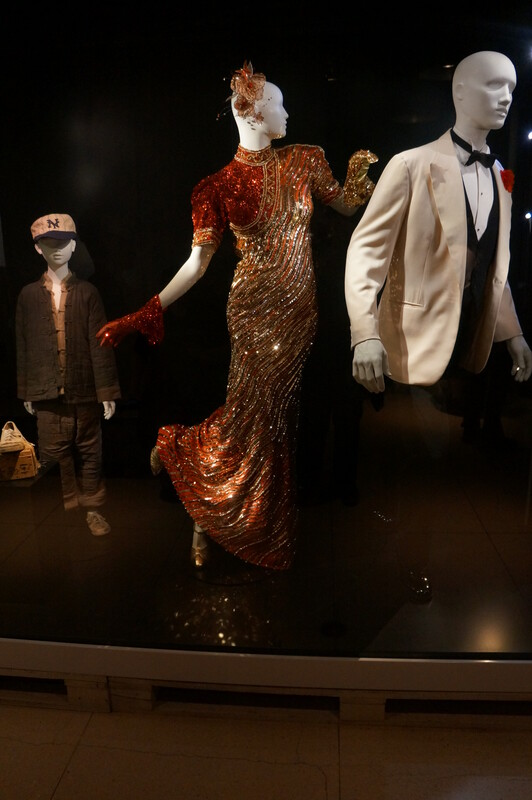 The beautiful red-beaded and sequined dress, worn by Willie Scott in “Indiana Jones and the Temple of Doom,” lived a life of danger. The first was eaten by an elephant. A costume designer was flown out to the set to create a new one. Costumes from “Indiana Jones and the Temple of Doom” are part of Indiana Jones and the Adventure of Archaeology exhibit. May 14-Jan. 3, 2016 at National Geographic in Washington, D.C. This exhibit has nothing from the “Young Indiana Chronicles” which ran from 1992-1993, later had made-for-tv movies in 1996, and were later put out on DVD. That series also included short historical documentaries. You can even have your picture taken with a (fake) Indiana Jones on the out. “Indiana Jones and the Adventure of Archeology” is at the National Geographic Museum, 1145 17th Street, NW (17th and M), Washington, DC 20036 through January 3, 2016. Tickets cost $15. The idol from “Raiders of the Lost Ark” is on display at “Indiana Jones and the Adventure of Archeology” at the National Geographic in Washington, D.C.
An angel from the Ark of the Covenant in “Raiders of the Lost Ark.” Indiana Jones and the Adventure of Archaeology exhibit. May 14-Jan. 3, 2016 at National Geographic in Washington, D.C.
Indiana Jones and the Adventure of Archaeology exhibit. May 14-Jan. 3, 2016 at National Geographic in Washington, D.C.
Henry Jones, Sr.’s diary from “Indiana Jones and the Lst Crusade” is part of Indiana Jones and the Adventure of Archaeology exhibit. May 14-Jan. 3, 2016 at National Geographic in Washington, D.C.
A Harley Davidson motorcycle from “Indiana Jones and the Kingdom of the Crystal Skull” is part of Indiana Jones and the Adventure of Archaeology exhibit. May 14-Jan. 3, 2016 at National Geographic in Washington, D.C.
A seated skeleton from “Indiana Jones and the Kingdom of the Crystal Skull” is part of ndiana Jones and the Adventure of Archaeology exhibit. May 14-Jan. 3, 2016 at National Geographic in Washington, D.C. This entry was posted in Uncategorized and tagged Archeology, Indiana Jones, National Geographic. Bookmark the permalink. Oh, I wish I could see this exhibit! Thanks for the review and the pix.